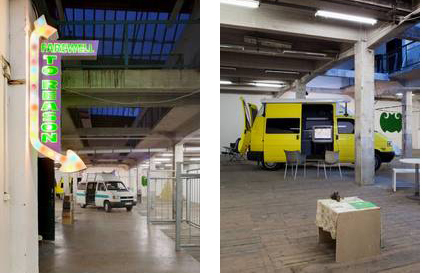 Until October 2006, CAPRI was a non-commercial artspace in Brunnenstrasse, Berlin-Mitte. Founded in 2001 by the artitsts Ina Bierstedt, Bettina Carl and Alena Meier, CAPRI realised over 70 exhibitions and events, presenting work by young international artists who often created site-specific installations for CAPRI's rather peculiar space in Brunnenstrasse. The three artists-curators always saw their project as a participant in local and international networks, and thus organsised several cooperations with non-commercial partners, among them artspaces in Paris, Amsterdam and Auckland (NZ). CAPRI Berlin continue their work as a collective of artists-curators. "I KNOW WHAT YOU DON'T SEE"
"ICH WEISS WAS DU NICHT SIEHST"
a series of three exhibitions, contrasting and combining works by Jörn Gerstenberg, Kuda begut Sobaki, Alena Meier, Wjatscheslaw Lopatin, Felix Loyke and Wladimir Winter. August 2003 - September 2003: a collaboration of CAPRI with artists and curators from and in New Zealand, resulting in exhibition projects in rm03/Auckland, RAMP Gallerie/Hamilton and CAPRI, Berlin.